In ALL CHILDISH THINGS, a group of life-long friends and Star Wars fans come up with the perfect caper: break into the Kenner warehouse and steal a treasure trove of Star Wars memorabilia. Everything starts off as smoothly as a Jedi mind trick until the Dark Side starts to beckon. 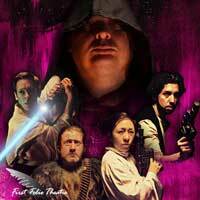 Will divided loyalties and greed lead their friendship to implode like the Death Star or will the Force be with them? "...Crucially, Zettelmaier (as he demonstrated in “Salvage”) has real affection for people absorbed in collectibles culture and doesn’t present them as easy targets of mockery. “All Childish Things,” as the name implies, is a less mature work. But there are some nicely modulated performances (including Richards’ decent doofus, whose Chewbacca impression is thoroughly endearing) and enough in-jokes to keep “Star Wars” aficionados happy – and to help the uninitiated understand why it matters to them." "..."All Childish Things" is steeped in "Star Wars" mythology (which Zettelmaier has clearly mastered as evidenced by his droll prologue mimicking "A New Hope's" opening crawl). Thus, it will resonate with aficionados without putting off casual fans who lack encyclopedic knowledge of the franchise." "...It's a measure of Zettelmaier's skill as a playwright that All Childish Things never feels formulaic even when it adheres most closely to the formula of the genre. Director Melanie Keller and her cast and crew at First Folio also deserve their share of praise. In their hands, the production unfolds with the grace of a well-maintained droid." "...You want a performer who can play Dave's Mom and have the audience crying from laughter? You hire Joe Foust. You want a performer who shows up as The Big Man and leaves the audience roaring without even saying anything? You hire Joe Foust. I'm not going to say anything else because you deserve the laughs."